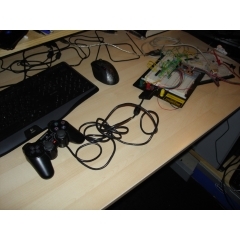 "I really believed there would be a conflict using the PS2 controller with the RFM12 modules, since they both use SPI. But the great thing is that Bill Porter wrote the PS2X library so that the pins are changeable, aka software SPI. So the RFM12B can use hardware SPI, and the PS2 can use its software SPI bit banging." I think that’s a brilliant idea.